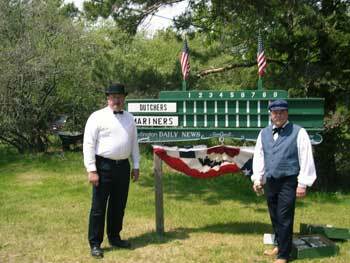 Not many things today have the staying power matching the Ludington Mariners Old Time Base Ball Team. First formed in in 1912, they played for three years before taking a break during the first World War. They played again from 1920-1922, then returned in 1926 and were known as the Ludington Tars. The Ludington Mariners played at Culver Park, where the Ludington Municipal Marina is now located. Their home field now is at Historic White Pine Village. They travel across the midwest to places such as Mackinac Island and Greenfield Village in Dearborn. The team was resurrected in 1993. They play by 1860 rules, which is "part historical reenactment and 50% real competition." 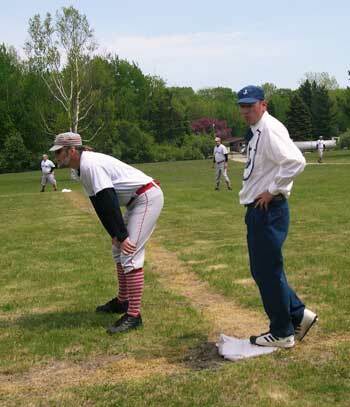 The team dresses in 1860s garb, including the umpires. Even some fans get in the spirit by dressing in period pieces. Many of the same players participate in games year after year, but the Ludington Mariners are always looking for new teammates. Watching a Ludington Mariners baseball match is the perfect summer activity. It's good, clean fun for the entire family, so bring your blanket or chair and catch one of the few upcoming games at Historic White Pine Village. While you are at Historic White Pine Village, take some time to discover small town Michigan life in the late 1800s and early 1900s and enjoy the beautiful setting overlooking Lake Michigan. You can visit more than 30 museums that depict Mason County's history, treat yourself to a cone at the Old Fashioned Ice Cream Parlor in the Town Hall, and browse the quaint Gift Shop which offers shirts, books, locally made products, old-fashioned wooden toys, Historic White Pine Village memorabilia and CDs by local artists such as the Scottville Clown Band. The 2019 schedule will be listed as it becomes available.